Historic Government Auction Seized Assets Sale - Saturday, March 10, 7:30 AM PST Government Auction announces its Historic Government Auction Seized Assets Sale with over 700 items and bidding starting as low as $1 for most items on the online auction site Proxibid. Featured items in this one day auction event include rare gold coins, high end fine jewelry, rolex watches, art prints, sports & Hollywood memorabilia, and collectibles. A few of the items to be auctioned off on this historic event will be; Stainless Steel Rolex Oyster Perpetual Daytona 1992 Watch, 1898-S U.S. $20 Liberty Head Gold Coin, 3,364.15CT Oval Cut Emerald Gemstone, MARC CHAGALL La Dormeuse Aux Fleurs Print, 1063-1089 AD India Kashmir Kalasa Ancient Coin, 374.53CT Ruby & Sterling Silver Necklace, Wicked Pony- By Frederic Remington- Bronze Reissue, Cartier Paris Quartz Swiss Stainless Steel Watch, 18 kt. Gold, 2.25CT Diamond Lalanne Swiss Quartz Watch, SALVADOR DALI Invisible Man Print, 18 kt. Gold, Citrine Pink Tourmaline & Diamond Necklace, Coach Original Black Leather Purse, Disney SERIGRAPH Cels, 14 kt. Yellow & White Gold 35.98CT Ruby Pendant, MARC CHAGALL Paris Opera Ceiling Print, 2.26CT Blue Sapphire & Diamond Ring, 1855 U.S. $1 Indian Head Gold Coin, 1925-D $2.5 U.S. Indian Head Gold Coin and more. Government Auction was founded as a general resource to buying assets such as jewelry , gemstones, memorabilia, collectibles, art, prints, antiques, and vehicles throughout the United States. Most people don't realize there are hundreds of thousands of assets and valuables that are seized everyday and made available through various resources. Many of these confiscated assets are passed on to us for immediate liquidation. Some examples of how we acquire requisitioned objects are from bankruptcies, IRS, estate sales, trusts, and more. 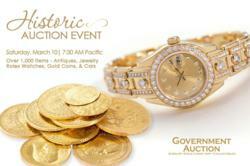 Government Auction is the largest company of its kind and the only one in the United States that works closely with these agencies to acquire literally thousands of assets and confiscated goods, such as Ruby Gemstones, Sapphire Rings, and Men's President Rolex Watches, Mercedes Benz, and Gold Coins. In most cases we acquire these treasures at a fraction of their actual retail value. Once acquired these items are liquidated through our auction site. Our clients are made up of just your everyday person who wants to buy a Diamond Bracelet, Pearl Strand Necklace, Sterling Silver Pink Sapphire Earrings, Oval Cut Emerald Gemstone Parcel, Remington Bronze Reissue at an unbeatable price. All assets that we offer are normally at a 30% - 60% savings to you. What this means is you are making a good investment immediately. By purchasing assets cheaply you can make a substantial profit if you decide to resell it later on. You are buying from the most reputable jewelry and gem clearinghouse company in the U.S., with over 20 years of experience.